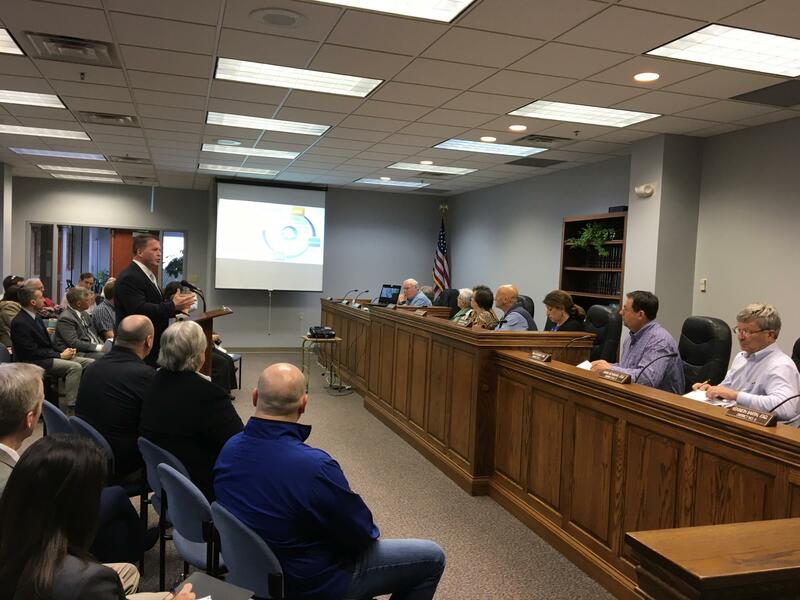 Barren County Fiscal Court listens to a presentation from Johnson Controls on its training program for jail inmates. Barren County is partnering with a local industry to train jail inmates for life outside the fence. Johnson Controls is establishing a training program for inmates to become certified HVAC technicians. The company and inmates will work to reduce energy costs in county-owned facilities. Kentucky Labor Secretary and former Barren County Judge-Executive David Dickerson says the results will be two-fold. “The community will have updated facilities that will be more maintenance and energy efficient, and then those savings that will be realized, will be used to fully fund the program to train the prospective employees that are presently behind bars," Dickerson told WKU Public Radio. The goal of the training and re-entry program is to teach the inmates skills that will lead to employment after their time is served. Johnson Controls has done similar programs in other states which has contributed to a decrease in recidivism. Low-level felons will receive classroom and hands-on instruction at a facility near the jail over the course of the six to 18-month program. While some inmates already do work on county-owned property, this is the first partnership with a private sector company. A launch date hasn't been announced. The Labor Cabinet and other state agencies intend to launch similar programs statewide that would include a wide range of vocational training, including plumbing and electrical work. City leaders in Glasgow have signed off on a syringe exchange for intravenous drug users. The program would allow addicts to swap dirty needles for clean ones at the local health department. The measure narrowly passed Monday evening on a 5-4 vote. Two council members were absent and another abstained from voting. Members of the LGBT community and their supporters want a judge in south central Kentucky to resign over his opposition to gay adoptions. Judge Mitchell Nance, a family court judge for Barren and Metcalfe counties, has recused himself from presiding over adoptions by homosexual parents. He said he believes allowing gay couples to adopt is not in a child’s best interest. His announcement has drawn a range of opinions, some calling for him to step down from the bench. Federal investigators say a single-engine plane went through a series of erratic turns followed by a sharp dive before it crashed in Kentucky earlier this month, killing all four people aboard. The Lexington Herald-Leader reports the preliminary findings from the National Transportation Safety Board also indicated there was heavy cloud cover in the area, and that the pilot did not have an instrument-flight rating and did not get a weather briefing before taking off from Union City, Tennessee, on Nov. 12. Those killed in the crash were attorney Scott T. Foster, the plane's owner; and his 15-year-old son, Noah; dentist Kyle P. Stewart; and attorney and Somerset police chaplain Doug Whitaker. Voters in Barren County and three Butler County have voted to allow alcohol sales. In Barren County, 4,651 people to expand alcohol sales, while 4,418 voted against it. That's a difference of just 233 votes out of more than 9,000 cast. The group Move Barren County Forward led the support for turning Barren County wet. They said money being spent on liquor in other areas will now stay in Barren County. Before Tuesday’s vote, Cave City had voted to go wet and alcohol sales by the drink were allowed in certain restaurants in Glasgow. Metcalfe, Adair and Russell counties all voted to go wet this year. It wasn’t a county-wide vote in Butler County, but the towns of Morgantown, Woodbury and Rochester all approved alcohol sales Tuesday night. Butler County voted to stay dry in January. The chief justice of the Kentucky Supreme Court says there’s a growing movement across the nation to reform the pre-trial justice system. John Minton, Jr. says the current method of setting bail disproportionately affects low-income defendants who aren’t able to pay for release after being charged with low-level, non-violent offenses. “We don’t need to lose sight of the number one, bedrock principle and that is the presumption of innocence operates in every case, so that presumption does not need to be lost," Minton told WKU Public Radio. A new poll suggests that a majority of Kentuckians think the nation’s criminal justice system is in need of reform, and they want U.S. Senate Majority Leader Mitch McConnell to bring reform legislation to the floor for a vote. Kentucky’s other U.S. Senator, Rand Paul, has long been a proponent of criminal justice reform. He spoke in a teleconference on Thursday with Senior White House Advisor Jared Kushner and representatives from the Justice Action Network and Freedom Works. State prisons are at capacity, county jails are overcrowded and the state is recommending transferring about 1,600 inmates to private prisons that have been shuttered for the past several years. Officials ended the state’s last private prison contract in 2013, partly as a cost savings measure and also in response to scandals at privately owned prisons in the state. John Tilley, secretary of the Justice and Public Safety Cabinet, said that it was “critical” that the Kentucky consider reopening the private prisons. He said past efforts to reduce the prison population haven’t panned out. Tilley said that many judges throughout the state haven’t bought into prison reforms, instead sentencing convicted criminals to incarceration over diversion or treatment programs that would keep people out of prison.